The John Albert Hall Lectures are a multi-part speaker series featuring expert perspectives on the changing role of religion in contemporary society. 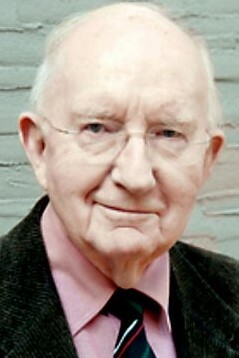 Herbert O’Driscoll is a respected and beloved writer, preacher, and proponent of Celtic spirituality. Last fall, he turned ninety. This spring, his latest book is being published. Entitled A Greening of Imaginations, it imagines the “back stories” of some favourite Biblical scenes and characters. In conversation with Ian Alexander, Herbert O’Driscoll reflects on his life and reads from his new book, copies of which will be available for purchase and autographing. Book signing to follow. Please consult the poster for more information. In this election year, how might Christians (and non-Christians) interested in progressive politics act and think? Should activists prioritize certain dire global situations (e.g., climate change), other more local challenges (e.g., homelessness), or international crises (e.g., refugees in Europe)? Do progressive Christians and like-minded members of other communities have a special role to play in contemporary Canadian politics? Join us for this open conversation with one of Canada’s senior political thinkers. Light refreshments will be served. For more information, please see the event poster. 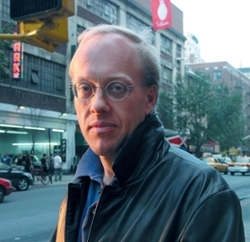 In this free public lecture, author and activist Christopher Hedges discusses the current state of religion and politics in the United States.Christopher Hedges is a Pulitzer Prize winning journalist, New York Times bestselling author, Princeton University lecturer and ordained Presbyterian minister. His latest book is America: A Farewell Tour (2018). An audio recording of the lecture is now available on our SoundCloud account. A video recording of the event is now available on Vimeo . The longstanding and systemic mistreatment, underpayment and sexual harassment of women and members of the LGBTQ2S+ community has been firmly in the public spotlight this past year thanks to movements such as #MeToo and Time’s Up. But how have Christian communities wrestled with these issues? Have there been gains in equality, empowerment and safety in Christian settings? Have Christians been advocates for change in wider society? Three leading women reformers reflect on the implications of biblical teachings and tradition in the struggle for justice in church and society. The lecture is free and open to the public. Light refreshments will be served. Cheri DiNovo is an ordained minister in the United Church of Canada and a former Ontario MPP. She introduced more successful LGBTQ2S+ legislation than any other MPP in Ontario history. Jennifer Henry is the Executive Director of Kairos: Canadian Ecumenical Justice Initiatives, and one of Canada’s leading proponents of Indigenous rights, as well as gender and migrant justice. Gina Messina is associate professor at Ursuline College, and co-founder of the online project Feminism and Religion. Her most recent book is Jesus in the White House (2018). Michelle Slater is lead minister at Oak Bay United Church. If you missed the event, we have a video recording of the panel discussion on Vimeo. Click here for a video recording of the interview. 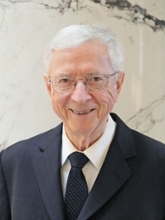 One of Canada’s longest serving Catholic bishops, participant in Vatican II, scholar, author, advocate on behalf of the poor and critic of capitalism--Remi De Roo has led a remarkable 94 year life of faith in action. Join him for an intimate encounter that includes a public interview with former CBC host Ian Alexander, and questions from the audience. Light refreshments will be served. Remi De Roo holds a doctorate in sacred theology from the Pontifical University of Saint Thomas Aquinas, Angelicum, in Rome, and is the only living Canadian bishop to have participated in all four sessions of the Second Vatican Council. He is the author of several books, including Cries of Victims--Voice of God (1986) and Chronicles of a Vatican II Bishop (2012). Considered a radical by some for his social views and reforming spirit, De Roo has clashed with popes and prime ministers in his efforts to champion the goals of Vatican II. Retired senator, first female moderator of the United Church of Canada, prolific author, national and international advocate and administrator—Lois Wilson has led a remarkable ninety-year life of faith in action. Join her for an intimate encounter, including a first-person interview with former CBC host Ian Alexander, questions from the audience, and a chance to meet Lois in person. Lois Miriam Wilson served as the first woman president of the Canadian Council of Churches (1976-1979), first Canadian president of the World Council of Churches (1983-1991), Chancellor of Lakehead University (1991-2000), and Canadian senator (1998-2002). 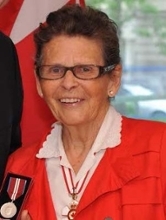 She is a Companion of the Order of Canada and recipient of the Pearson Medal of Peace. Dr. Wilson is currently a senior fellow at Massey College, University of Toronto, and distinguished minister- in-residence at Emmanuel College, University of Toronto. Regardless of our own religious views or even whether or not we are religious believers at all, the Protestant Reformation of the sixteenth century continues to influence life in North America in the early twenty-first century. What started with one man, Martin Luther, and his objections to misunderstandings and abuses of indulgences quickly became a movement that escaped his control in central Europe, dividing not only evangelicals from defenders of the Roman Church but also evangelicals among themselves. The European religio-political conflicts from the 1520s through the 1640s tore apart a continent, prompting ideological and institutional changes that, taken together, forged the modern Western world as reactions to the problems inherited from the Reformation era. The Reformation unintentionally made Western Christianity into an enduring problem, the solutions to which have circumscribed religion and unintentionally led to the secularization of Western society. Brad Gregory is Professor of History and Dorothy G. Griffin Collegiate Chair at the University of Notre Dame, where he is also Director of the Notre Dame Institute for Advanced Study. From 1996-2003 he taught at Stanford University, where he received early tenure in 2001. He specializes in the history of Christianity in Europe during the Reformation era and on the long-term influence of the Reformation era on the modern world. He has given invited lectures at many of the most prestigious universities in North America, as well as in England, Scotland, Ireland, Northern Ireland, Finland, Norway, Sweden, Germany, Belgium, the Netherlands, Spain, Italy, Israel, Taiwan, Australia, and New Zealand. Before teaching at Stanford, he earned his Ph.D. in history at Princeton University and was a Junior Fellow in the Harvard Society of Fellows; he also has two degrees in philosophy from the Catholic University of Louvain, Belgium. His first book, Salvation at Stake: Christian Martyrdom in Early Modern Europe (Harvard, 1999) received six book awards. Professor Gregory received two teaching awards at Stanford and has received three more at Notre Dame. He was the inaugural winner (2005) of the first annual Hiett Prize in the Humanities, a $50,000 award from the Dallas Institute of Humanities and Culture given to the outstanding mid-career humanities scholar in the United States. His most recent book is entitled The Unintended Reformation: How a Religious Revolution Secularized Society (Belknap, 2012), which received two book awards. His forthcoming book is entitled Rebel in the Ranks: Martin Luther, the Reformation, and the Conflicts that Continue to Shape Our World (Harper, 2017). Salvation at Stake: Christian Martyrdom in Early Modern Europe (Cambridge, Mass., and London: Harvard University Press, 1999). The Unintended Reformation: How a Religious Revolution Secularized Society (Cambridge, Mass., and London: Belknap Press of Harvard University Press, 2012). “The Radical Reformation,” in The Oxford Illustrated History of the Reformation, ed. Peter Marshall (Oxford: Oxford University Press, 2015), pp. 115-151. The ideal of reforming the institutional church both united and divided Christians after the momentous events of 1517. The explorers and settlers who came to Canada shared an assumption that a “Christian society” would take shape in the New World. But they also brought with them the rival loyalties of a divided Christendom. Long after the Peace of Westphalia ended the wars of religion in Europe in the 17th century, the competition for souls continued on a number of fronts, among them the race to convert Indigenous peoples, moral campaigns aimed at infusing Canadian society with Christian values, and the movement to unite three Protestant churches in an effort to meet more effectively the religious needs of newcomers to Canada. Organized religion is now situated in a new world order that is as disruptive to old assumptions about belief and belonging as the social revolution that propelled the European Reformation five hundred years ago. Over the last half century, the ideal of religiously pluralistic Canada has replaced the assumption of a Christian society. The verbal skirmishes between Catholics and Protestants have ended. And yet the theme of “reformation” has been playing with new variations in recent decades. The debate about belief is not only about competing doctrines of God, but whether there is a God. The institutional church faces challenges not only from reformers seeking new forms of spiritual community, but also from those who are indifferent to belonging to any community of faith. Phyllis Airhart is Professor of the History of Christianity and Interim Principal (2017–18) at Emmanuel College. She is also on the faculty of the Graduate Centre for Theological Studies at the Toronto School of Theology and cross-appointed to the Department for the Study of Religion at the University of Toronto. She is the author of A Church with the Soul of a Nation: Making and Remaking the United Church of Canada, winner of the 2016 book prize from the Canadian Society for the Study of Religion and shortlisted for the 2015 Canada Prize in the Humanities from the Federation for the Humanities and Social Sciences. 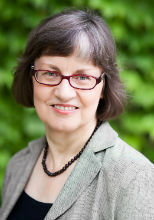 Her other publications include Serving the Present Age: Revivalism, Progressivism, and the Methodist Tradition in Canada as well as a number of articles on religion in Canada, most recently “The Accidental Modernists: American Fundamentalism and the Canadian Church Union Debate” in Church History (March 2017). She is co-editor of Faith Traditions and the Family; a special issue of Toronto Journal of Theology titled Christianizing the Social Order: A Founding Vision of The United Church of Canada; and Doing Ethics in a Pluralistic World: Essays in Honour of Roger C. Hutchinson. Airhart is a past recipient of Victoria University’s Award for Excellence in Teaching and the United Church of Canada’s Davidson Trust Award for excellence in teaching and scholarship in theological education. Her research interests include North American Christianity, religion and public life, and the history of spirituality. "Listening to the World." Chap. 8 in A Church with the Soul of a Nation: Making and Remaking the United Church of Canada. (Montreal and Kingston: McGill-Queen’s University Press, 2013). Over one hundred years ago, Max Weber argued that Protestantism “disenchanted” the world and eliminated “magic” from it. Today, as we celebrate the 500th anniversary of the Protestant Reformation and ask what effects it may still have on us, this assertion needs to be reappraised. Did Protestants really vanquish “magic,” and, if so, what was that “magic”, exactly, or the “disenchantment” that accompanied its demise? Exploring the various ways in which Protestantism redefined the sacred might yield useful answers to such questions and allow us to appreciate more fully what the Protestant Reformation bequeathed to the world. Carlos Eire was born in Havana in 1950 and fled to the United States without his parents at the age of eleven. He is now the T. L. Riggs Professor of History and Religious Studies at Yale University, where he has served as chair of the Department of Religious Studies and the Renaissance Studies Program. He has taught at St. John’s University in Minnesota and the University of Virginia, has been a Fulbright scholar in Spain, a Fellow of the Institute for Advanced Study in Princeton, and a member of the Lilly Foundation’s Seminar in Lived Theology. 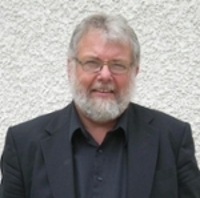 He is the co-author of Jews, Christians, Muslims: An Introduction to Monotheistic Religions (1996), and the author of several scholarly books, including War Against the Idols (1986), From Madrid to Purgatory (1995), A Very Brief History of Eternity (2009), and Reformations: The Early Modern World (2016), which won the Hawkins Award from the Association of American Publishers. A past president of the American Society for Reformation Research, he is best known outside scholarly circles as the author of the memoir Waiting for Snow in Havana (2003), which won the nonfiction National Book Award, and his second memoir, Learning to Die in Miami (2010). All of his books are banned in Cuba, where he has been proclaimed an enemy of the state – a distinction he regards as the highest of all honors. “The Good, the Bad, and the Airborne: Levitation and the History of the Impossible in Early Modern Europe,” Ideas and Cultural Margins in Early Modern Germany, ed. By Robin Barnes, et. al., (Ashgate, 2009). “John Calvin, Accidental Anthropologist,” John Calvin and Catholicism, ed. by Randall Zachman (Baker Books, 2008). Luther did not set out to be a reformer, but his calls for changes in medieval religion got him kicked out of the church and helped unleash unrest throughout sixteenth century Europe. While Luther focused on religious reform, his defiant spirit inspired others to revolution, leading to battles that exacted great loss of life. Luther continued to face sanctions by church and state even as his reforms were critiqued for not going far enough. And venomous writings of his final years threaten to overshadow the significance of his Reformation accomplishments. Five hundred years later Luther’s approach to reform continues to inspire wide-ranging contemporary reform movements, such as those addressing gender and racial injustice in the church and beyond. 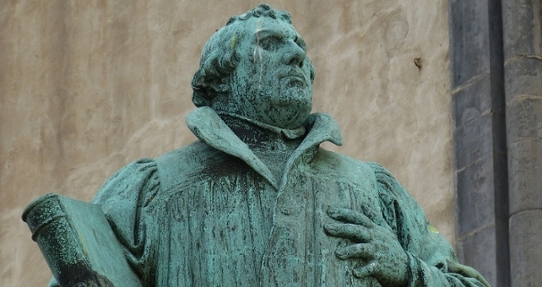 This year’s anniversary of the Reformation brings with it opportunities to reflect on the profound ambiguities of Luther’s legacy and the possibilities of embracing his legacy of bold and prophetic protests of abuse and injustice while condemning his legacy of demonizing his opponents. Deanna Thompson is professor of Religion at Hamline University, where she also teaches classes in African American Studies, Women Studies, and Social Justice. She has been awarded Faculty of the Year by faculty and students alike, and has also received advising awards. A respected scholar in the study of Martin Luther and feminist theology, many of Thompson’s publications—including her book, Crossing the Divide: Luther, Feminism, and the Cross (Fortress, 2004)—focus on bringing Lutheran and feminist theology together in generative ways. Since the publication of her theo-memoir, Hoping for More: Having Cancer, Talking Faith, and Accepting Grace (Cascade, 2012), Thompson speaks and publishes widely on thinking theologically about living with cancer. Thompson was also one of 38 theologians chosen by Westminster John Knox Press to get back to doing what theologians used to do: write commentary on Scripture. Her theological commentary on Deuteronomy was released in 2014 and won Resource Book of the Year by the Academy of Parish Clergy. Her latest book, The Virtual Body of Christ in a Suffering World (Abingdon, 2016) focuses on the digital revolution and its potential for helping us better care for one another in the worst times of our lives. Thompson received a 2016-7 sabbatical grant from the Louisville Institute for her project: “Glimpsing Resurrection: A Post-Traumatic Theology of Cancer.” Thompson is active in the American Academy of Religion, where she served on the Board of Directors, as Director of the Upper Midwest Region, and as co-chair of the Martin Luther and Global Lutheran Traditions Program Unit. “Calling a Thing What It Is: A Lutheran Approach to Whiteness,” Dialog: A Journal in Theology, (Spring 2014). “Hoping for More: How Eschatology Matters for Lutheran Feminist Theologies,” in Transformative Lutheran Theologies: Feminist, Womanist, and Mujerista Voices, ed. Mary Streufert (Minneapolis: Fortress Press, 2010). Between January and June 2018, we are hosting two interview-style events. The interviews are a forum for individuals with notable careers in religion and civil society to reflect on contemporary issues. "An Interview with Lois Wilson" was held on January 30, 2018, and "Reforming Tradition: A Conversation with Remi de Roo" will be held on June 21, 2018. Details of both are included below. For a list of our most recent events, please visit our events page. In autumn 2017, join us for a special series of four lectures, between September and November, focusing on themes related to the 500th anniversary of the Reformation. For detailed information about the upcoming lectures, click on the tabs below. For a quick overview of the lecture dates, please look at the series poster. Support for both the John Albert Hall Interview and Lecture series is generously provided by the Anglican Diocese of BC John Albert Hall Trust. Interviews and lectures are free and open to all members of the public and university community. Video recordings of past John Albert Hall Lectures are available on the CSRS Vimeo site.